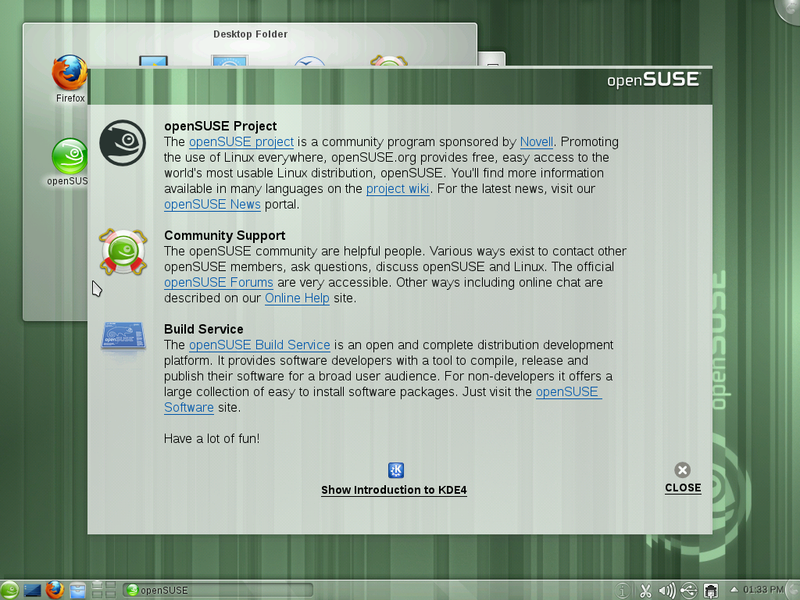 This is a guide on installing openSUSE 11.4 from a single Live CD. 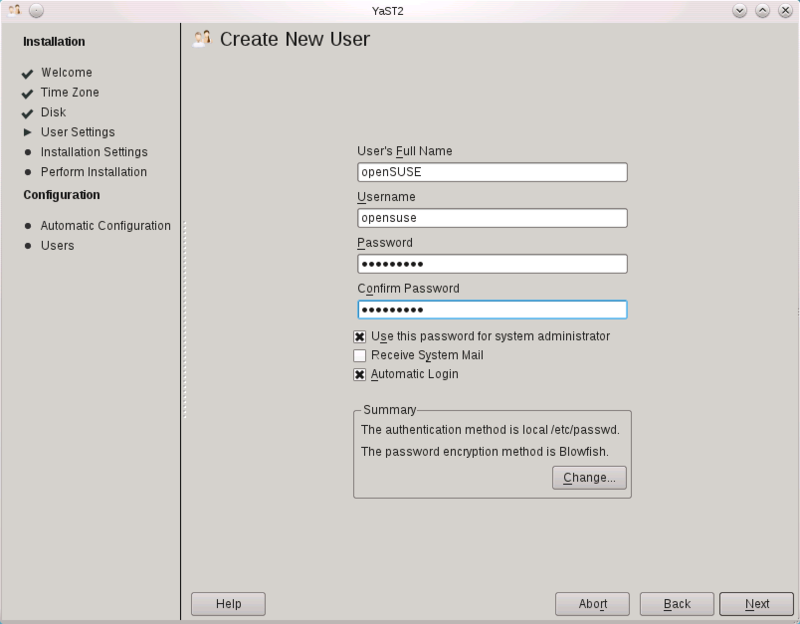 This is a basic overview of the installation steps for most users. For more information, please refer to the Installation page on how to install openSUSE on specific platforms, and to the Installation help page for more information. 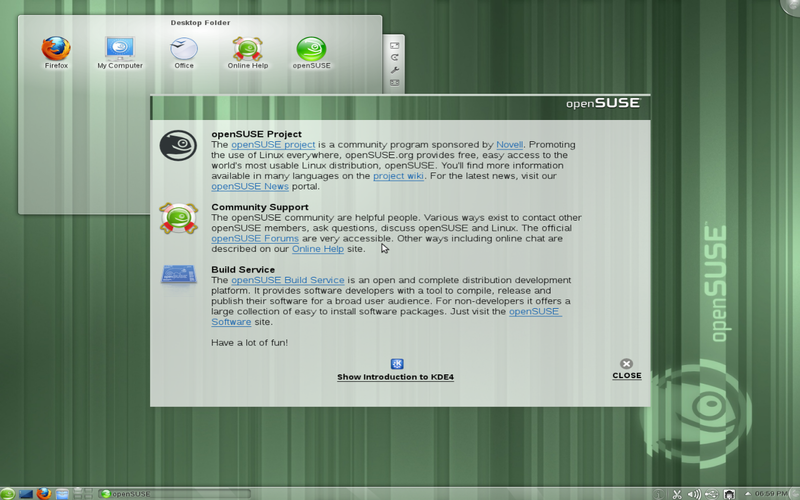 To see what it will be like choose openSUSE 11.4 and wait for the openSUSE 11.4 desktop to load. This is the default option and does not alter your computer. If you choose the install option you will go directly to Step 1. The live CD boots into a fully-functional openSUSE desktop. There will be some limitations that protect your data. Feel free to explore the desktop, and when you're ready to install, double-click the Live Install icon. This will start YaST, the openSUSE installation and configuration program. On top of the page you can set your language and keyboard layout. When the language is set, YaST will choose the applicable keyboard layout for you. However, if this is not correct, you can rectify this with the keyboard layout pull-down menu. 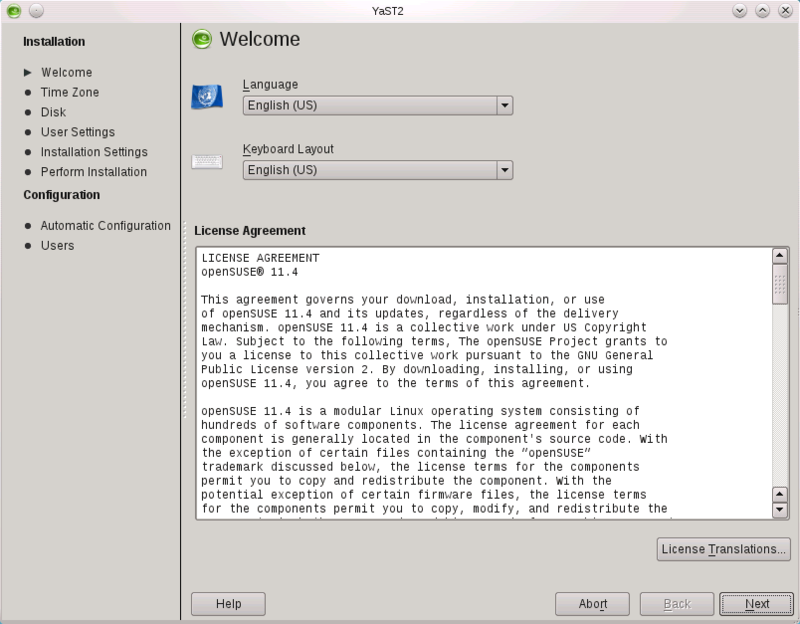 Under the settings the end user license agreement (eula) is shown To see the license agreement in other languages, click License Translation. If you accept the license, click Next. 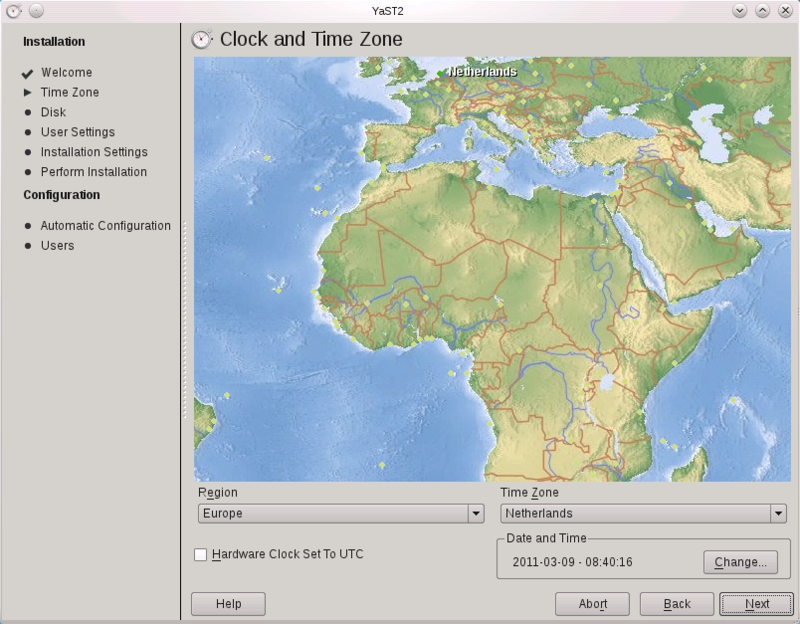 If you have a working internet connection, you can use a NTP server. 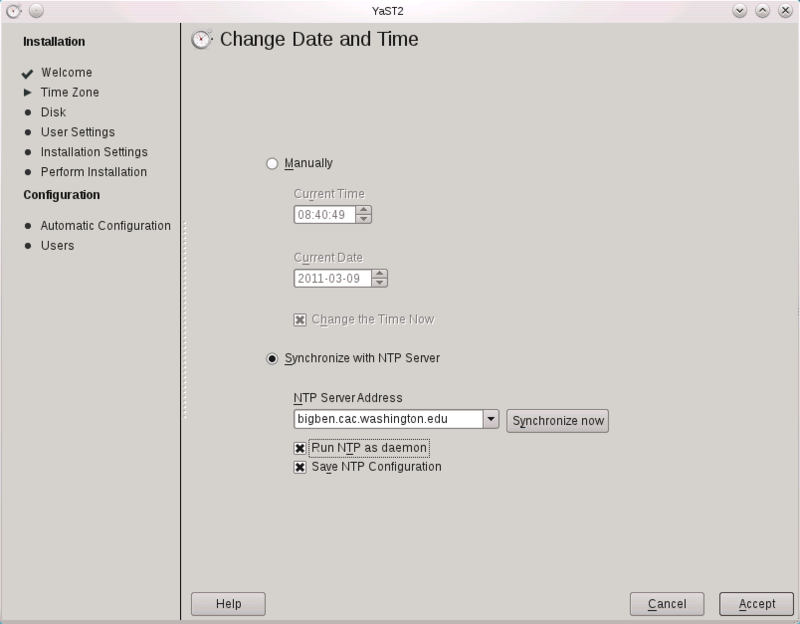 A NTP server is used for time synchronization. You can choose the Run as daemon option if you want your time to be synchronized on every boot. The time will automatically be synchronized after clicking Accept. A suggested partition scheme for your hard disk is shown. If you have another operating system installed on the same hard disk (for example, Microsoft Windows or another Linux), YaST will resize that operating system so that it still on your computer, but has enough room to install openSUSE 11.4. Many users will be upgrading from previous dual boot windows-linux distributions. YaST will detect empty ext3 partitions, say on a second hard disk and offer to convert them to ext4. For example if there are two empty ext3 partitions it will create an root ext4 partition and data ext4 partition, with the larger partition being assigned to data (/home) by default. On modern systems the scary warning in the Boot section just before commitment during installation, that GRUB will place the bootloader above 125 GBytes and the user is risking that the bootloader will not be found can be disregarded (of course with a certain risk). A check is possible before commitment if you cancel the install at this stage before you lose a useful MBR. Without a valid MBR a disk will not be accessible anymore and steps must be taken to recover all the data on that disk You can do this in an old linux distro that uses GRUB by copying your old linux root partition to the partition that you will use, and adding a new entry to GRUB menu.lst with as root partition this test root partition. If a boot test goes well you can then delete the contents of the temporary test root partition and the SUSE installer may well use it as its default root ext4 partition. This page was last modified on 10 August 2011, at 22:29. This page has been accessed 117,138 times.